Peripartum cardiomyopathy (PPCM) is a disease affecting the parturient during late pregnancy or immediately after delivery. This unique disorder not just endangers the life of mother and progeny but is also a financial burden to the health system due to its potential to cause prolonged and persistent cardiac function insufficiency in the mother. The hallmark of the disease is onset of decreased cardiac ejection fraction either in the late pregnancy or early puerperium. Over the last few decades, the disease has been extensively researched and investigated to formulate diagnostic guidelines and therapeutic approaches. Many theories regarding its pathophysiology have also been proposed. The clinical presentation and the basic and intensive interventional strategies of the disease are more or less similar to that of dilated cardiomyopathy due to any other cause; however, at all points of time the pregnant or lactating state of mother and the subsequent effect of the medication and therapeutic interventions on the fetus or neonate needs to be considered. 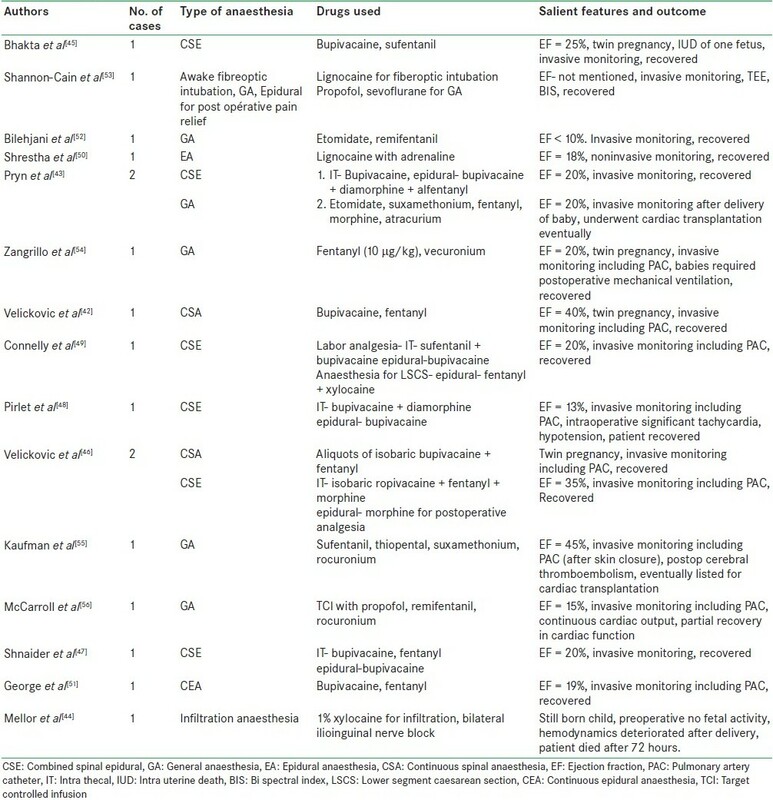 Apart from intensive care management, these patients may also require anaesthetic intervention for management of painless labor and/or either vaginal or operative delivery. Favorable maternal and fetal outcome require that the basic hemodynamic goals be always kept in mind while choosing the techniques and drugs to provide anaesthesia to the patients with PPCM. Literature search of the anaesthetic management of patients with diagnosis of PPCM undergoing operative delivery reveals both general and regional anaesthesia being used with comparable outcomes. Peripartum cardiomyopathy (PPCM) was first reported in the year 1849. Till the middle of 20 th century it was known as postpartal cardiomyopathy , as most of the cases reported had symptomatic onset in the postpartum period only. Demakis et al., were probably the first to realize this as more of a peripartum disease rather than a postpartum one, hence the term peripartum cardiomyopathy was considered more acceptable. The first case series of patients with PPCM was published in the year 1971  by Demakis et al. They described the data about 27 patients who presented in the late pregnancy or early puerperium with heart failure. The authors themselves devised a diagnostic criteria that included development of cardiac failure in the last month of pregnancy or within 5 months of delivery, absence of a determinable aetiology for the cardiac failure and absence of demonstrable heart disease before the last month of pregnancy. Over the years, the diagnostic criteria have remained almost the same with the addition of echocardiography findings as another parameter. As more and more research is being conducted, a lot more is now known about the pathophysiology, epidemiology, diagnosis and clinical outcome of the disease. At the same time, the unique anaesthetic challenge that these patients pose for management of their pregnancy was also recognized. This review will undertake a comprehensive look on the above and give a detailed account of the treatment modalities available for this disease in present times. Earlier, in the year 1997, the National Heart, Lung and Blood Institute and the Office of Rare Diseases of the National Institutes of Health had convened a Workshop on Peripartum Cardiomyopathy to foster a multidisciplinary review and defined the diagnostic criteria  based on the work by Demakis et al. [Table 1]. This definition was being followed comprehensively till now, but the European Society definition claims to be more simplified and capable of preventing underdiagnosis of the disease. Several mechanisms have been postulated to explain the pathogenesis of PPCM although no single factor has ever been implicated in all the cases. The disease is now known to have a multifactorial pathogenesis. The goals of medical management in a patient diagnosed with PPCM should include measures to improve oxygenation and maintain cardiac output so as to improve both maternal and fetal outcome. Interventions are required to decrease both preload and afterload as well as to improve cardiac contractility. Mild to moderate symptoms may be managed with rest, salt restriction and diuretic therapy. Oxygen may be instituted via face mask, or continuous positive airway pressure may be applied up to a level which does not further jeopardize the cardiac output. Salt restriction helps in preventing further water retention, while diuretics help in decreasing pulmonary congestion. Fluid restriction may not be warranted in patients with mild to moderate heart failure. Hydralazine and nitrates decrease the afterload and are the mainstay of treatment in pregnant patients with heart failure. Calcium channel blockers, except amlodepine, have a negative inotropic effect and should be avoided. Amlodepine may be used if PPCM is associated with pre-eclampsia to control blood pressure. ACE inhibitors, both direct acting or receptor blockers, although the first line of drug for patients in heart failure due to any cause, are however, contraindicated in pregnant females due to the risk of fetal toxicity associated with them. They, however, should be used in all symptomatic patients in the postpartum period and are safe for the breastfed infant. Beta-blockers such as metoprolol decrease the heart rate, improve left ventricular diastolic function and protect against arrhythmias but are only used as a second line of treatment as their prolonged usage in the prenatal period is associated with low-birth weight of the baby. However, their use is considered safe during lactation. Digoxin may be indicated in certain patients for its inotropic effect. Although it is a safe drug to be used during pregnancy and puerperium, its plasma level needs to be strictly maintained in the therapeutic range with close monitoring. Anticoagulation is recommended in patients with PPCM, especially if the ejection fraction is less than 35% and there are other associated risk factors such as severely dilated ventricles, atrial fibrillation and presence of mural thrombus on echocardiography or history suggestive of previous thromboembolic episodes. The risk of venous thromboembolism is per se increased in pregnant patients and associated heart disease and bed rest (if advised for heart failure) may further increase the risk of development of this complication. Warfarin is teratogenic in early pregnancy and can cause fetal warfarin syndrome, while intake in the second and third trimester may lead to fetal cerebral hemorrhage, microcephaly, blindness, deafness and growth retardation. Unfractionated heparin on the other hand has low bioavailability in pregnant patients and is associated with thrombocytopenia. Thus, low-molecular-weight heparins are preferred in pregnancy as they do not cross the placenta, have a lower risk of osteoporosis and thrombocytopenia and their bioavailability is more predictable. In the postpartum period, thromboprophylaxis may be continued with warfarin if required as it appears in the breast milk in very insignificant quantities. If the patient presents with acute failure, it is important to undertake urgent steps to achieve above goals. Such a patient would usually be managed best in an intensive care unit. The patient is nursed in a propped up position with continuous hemodynamic and oxygenation monitoring which may warrant central venous and arterial cannulation. Pulmonary artery wedge catheter may also be required in patients on high dose of multiple cardiac drug infusions. Noninvasive ventilation with suitable positive end expiratory pressure may be instituted if oxygen by simple face mask fails to improve SpO 2 more than 95%. In case invasive ventilation is required, standard precautions regarding potential for aspiration in a pregnant patient should be taken. Loop diuretics may be more amenable in a patient in acute failure for their efficacy. Nitroglycerine should be given via intravenous infusion to decrease afterload if the systolic blood pressure is more than 110 mm Hg. Nitroprusside, however, may be relatively contraindicated in pregnant patients due to risk of thiocyanate and cyanide accumulation in the fetus. Nitroglycerin (NTG) should be titrated to effect starting from a dose of 10-20 μg/min up to a maximum of 200 μg/min. Dobutamine, dopamine and milrinone can be used to provide inotropic support to the failing heart. These inotropes along with nitroglycerine can be used in pregnancy if conditions exist to warrant their use. Levosimendan is another novel cardiotropic agent that improves cardiac output by increasing the response of myofilaments to intracellular calcium unlike the above mentioned traditional inotropes that do so by increasing the intracellular calcium itself. Levosimendan has been proven to be effective in improving the cardiac output and decreasing mortality , in patients with severely low output cardiac failure; however, its safety and efficacy in PPCM have not been evaluated by randomized controlled studies although reports of its successful use in this condition are there in the literature. , Levosimendan is used as an intravenous infusion at the rate of 0.1-0.2 μg/kg/min in cardiac failure with or without a loading dose of 3-12 μg/kg over 10 minutes. Hemodynamically unstable pregnant patients who are on multiple drugs should also undergo intensive fetal monitoring and continuous evaluation by obstetricians to prevent fetal loss. It was not until 1985 when the first report of a patient undergoing caesarean section under anaesthesia with PPCM was reported. A literature review done with PPCM and anaesthesia as key words on Pubmed revealed 41 results in English language. A further search on Google revealed another five articles. A total of 46 articles were analyzed, out of which there were six review articles and two reports describing management of patients with familial dilated cardiomyopathy during pregnancy. The 38 case reports were further sieved for postnatal and prenatal diagnosis. Out of these 38 reports, 22 described patients who were diagnosed as PPCM after delivery of the child, either operative or vaginal. 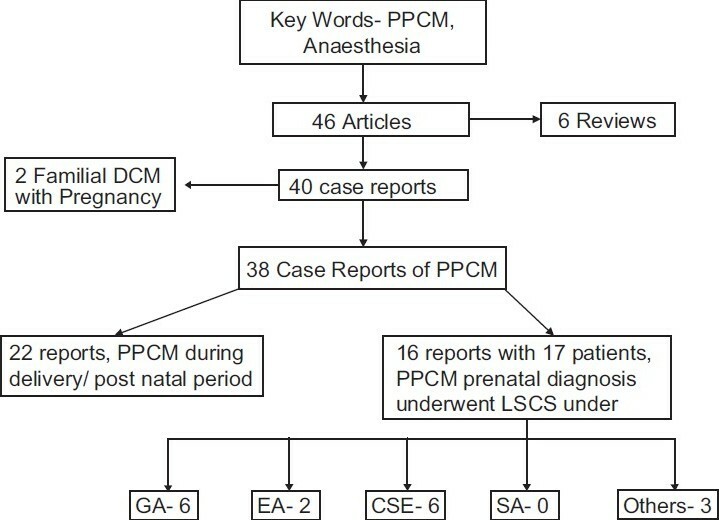 The rest of the 16 reports describe 17 patients who had prenatal diagnosis of PPCM and underwent LSCS under anaesthesia. In the latter group of patients, anaesthetic management included general anaesthesia, regional anaesthesia, or both. The data have been tabulated [Table 2] and [Figure 1] for further elucidation. Patients with prenatal diagnosis of PPCM need to be treated by a multidisciplinary approach with cardiologists, anaesthetists, intensivists and neonatologists being actively involved in the obstetric management. Issues such as whether the pregnancy should be allowed to reach term and the mode of delivery need to be addressed by the team with a tailored approach according to the patient's medical status on a periodical basis. In general, unless there is deterioration in the maternal or fetal well-being, there is no need for urgent or emergent delivery and the pregnancy is allowed to progress to term. The patient may be allowed to deliver the baby vaginally or operatively according to obstetric parameters or patient's wish. The vaginal delivery needs to be done with continuous hemodynamic monitoring and even invasive monitoring has been advocated according to patient's profile. Pain and anxiety associated with labor can increase sympathetic nervous system activity with a resultant increase in cardiac output and peripheral vascular resistance leading to an increase in cardiac afterload. This sympathetic activity also decreases uteroplacental outflow, thus jeopardizing an already compromised fetus. Effective labor analgesia decreases sympathetic outflow and decreases plasma catecholamine levels in the mother. Multiple modalities of labor analgesia can be provided to these patients to prevent increase in cardiac afterload associated with labor pains, but regional anaesthesia (RA) remains the method of choice as the sympathectomy associated with it causes a decrease in cardiac preload and afterload which is beneficial in patients with PPCM. ,, RA, however, may be contraindicated in an anticoagulated patient. The second stage of labor during vaginal delivery needs to be curtailed by application of forceps or vacuum to expedite the delivery of the baby. It is important to prevent any fluid overload during labor and delivery. Techniques of RA used include combined spinal epidural (CSE) in six patients, ,,,,, continuous spinal anaesthesia (CSA) in two patients, , and CEA in two patients. , RA provides many advantages for patients with PPCM. Sympathetic blockade associated with RA is beneficial in a decompensated heart as it decreases both preload and afterload. Use of a catheter gives freedom of titrability of the local anaesthetic drug both in epidural and intrathecal space. Thus, the level of motor and sensory block can be gradually increased so as not to cause sudden hypotension which can lead to sudden decompensation in these patients. Schnaider et al. describe CSE in a morbidly obese patient with an ejection fraction of 20% who underwent caesarean section successfully under RA and had an uneventful perioperative course. They preferred CSE over CEA as it has lower failure rate, better patient satisfaction and pain scores and superior hemodynamic profile than the CEA. Velickovic et al. advocate CSA for its more rapid and effective titrability. , They inserted a 19-G flexible single orifice catheter in the intrathecal space and gave small boluses of bupivacaine with fentanyl in dextrose to achieve the desired level of anaesthesia. The catheter was left in situ for several hours postoperatively for management of postoperative pain and possible postdural puncture headache. George et al. have described the management of a patient with PPCM with CEA using bupivacaine with fentanyl in which the level of anaesthesia was slowly allowed to develop over 6 hours. They enumerate many advantages of CEA which include avoidance of cardio-depressant general anaesthetic drugs, easy and slow titrability and improvement in cardiac function due to decrease in cardiac preload and afterload. GA has been described in six patients. ,,,,, The choice of anaesthetic technique is the anaesthetist's prerogative and if the goals of hemodynamic management are adhered to, the outcome can be expected to be favorable of the anaesthetic technique used. For any urgent or emergent lower segment caesarean section (LSCS), GA is preferred. GA is also preferred in patients with borderline cardiac decompensation as an already dyspneic patient may not be amenable to the procedure of RA. In such a patient, even minor degrees of sympathetic blockade associated with RA may lead to fulminant cardiac failure. Another contraindication to RA is the anticoagulated patient. McCarroll et al. describe the caesarean section in a patient with PPCM under GA with use of remifentanil and propofol. Remifentanil was chosen for its efficacy in controlling intraoperative stress response and rapid recovery independent of duration of infusion. They feel that the hemodynamic responses of the patient during a general anaesthetic technique using appropriate agents are more predictable than those seen with RA. Similarly, Zangrillo et al. believe that potential benefits of cardiovascular effects of RA may not be greater than the risks of maternal hypotension and low cardiac output in such a patient. Excessive reduction of preload may worsen cardiac output, while the decrease in after load can actually jeopardize coronary perfusion in some patients. Opioid-based anaesthesia provides good hemodynamic control and obtundation of response to endotracheal intubation but may require postoperative ventilatory support for both mother and neonate. Thus, it is obvious that favorable maternal and fetal outcome is not dependent on anaesthetic technique, but strict hemodynamic control and meticulous cardiovascular monitoring with close coordination between various involved specialists. Use of other nonanaesthetic drugs intraoperatively should be done with caution. Ergometrine should preferably be avoided and oxytocin should be given as an infusion or slowly titrated to response. Autotransfusion after delivery can be countered by a small dose of furosemide just before delivery of the baby. PPCM is a disease associated with high morbidity and mortality and can lead to maternal and fetal loss and persistent decrease in quality of life in mother. Early diagnosis, continued monitoring and prolonged therapy may be beneficial in a good amount of patients. Principles of therapy remain more or less same as that in heart failure due to any cause, but careful selection of drugs is important with due consideration to the pregnant or lactating mother. The anaesthetists may be involved in the intensive care management of an acutely decompensating patient or anaesthetic management of labor and operative or nonoperative delivery. In all the situations, careful and intense hemodynamic monitoring and slow and judicious titration of anaesthetic drugs is important to provide good maternal and fetal outcome. 1. Demakis JG, Rahimtoola SH. Peripartum Cardiomyopathy. Circulation 1971;44;964-8. 2. Hull E, Hafkesbring E. "Toxic" post partal heart disease. N Orleans Med Surg J 1937;89:550-7. 3. Pierce JA, Price BO, Joyce JW. Familial occurrence of postpartal heart failure. Arch Intern Med 1963;111:651-5. 4. Demakis JG, Rahimtoola SH, Sutton GC, Meadows WR, Szanto PB, Tobin JR, et al. Natural Course of Peripartum Cardiomyopathy. Circulation 1971;44;1053-61. 5. Pearson GD, Veille JC, Rahimtoola S, Hsia J, Oakley CM, Hosenpud JD, et al. Peripartum cardiomyopathy: National Heart, Lung, and Blood Institute and Office of Rare Diseases (National Institutes of Health) workshop recommendations and review. JAMA 2000;283:1183-8. 6. Sliwa K, Hilfiker-Kleiner D, Petrie MC, Mebazaa A, Pieske B, Buchmann E, et al. Current state of knowledge on aetiology, diagnosis, management, and therapy of peripartum cardiomyopathy: A position statement from the Heart Failure Association of the European Society of Cardiology Working Group on peripartum cardiomyopathy. Eur J Heart Fail 2010;12:767-78. 7. Pandit V, Shetty S, Kumar A, Sagir A. Incidence and outcome of peripartum cardiomyopathy from a tertiary hospital in South India. Trop Doct 2009;39:168-9. 8. Hasan JA, Qureshi A, Ramejo BB, Kamran A. Peripartum cardiomyopathy characteristics and outcome in a tertiary care hospital. J Pak Med Assoc 2010;60:377-80. 9. Chee KH, Azman W. Prevalence and outcome of peripartum cardiomyopathy in Malaysia. Int J Clin Pract 2009;63:722-5. 10. Pyatt JR, Dubey G. Peripartum cardiomyopathy: Current understanding, comprehensive management review and new developments. Postgrad Med J 2011;87:34-9. 11. Rizeq MN, Rickenbacher RR, Fowler MB, Billingham ME. Incidence of myocarditis in peripartum cardiomyopathy. Am J Cardiol 1994;74:474-7. 12. Midei MG, DeMent SH, Feldman AM, Hutchins GM, Baughman KL. Peripartum myocarditis and cardiomyopathy. Circulation 1990;81:922-8. 13. Bultmann BD, Klingel K, Nabauer M, Wallwiener D, Kandolf R. High prevalence of viral genomes and inflammation in peripartum cardiomyopathy. Am J Obstet Gynecol 2005;193:363-5. 14. Warraich RS, Sliwa K, Damasceno A, Carraway R, Sundrom B, Arif G, et al. Impact of pregnancy-related heart failure on humoral immunity: Clinical relevance of G3-subclass immunoglobulins in peripartum cardiomyopathy. Am Heart J 2005;150:263-9. 15. Ntusi NB, Mayosi BM. Aetiology and risk factors of peripartum cardiomyopathy: A systematic review. Int J Cardiol 2009;131:168-79. 16. Ansari AA, Fett JD, Carraway RE, Mayne AE, Onlamoon N, Sundstrom JB. Autoimmune mechanisms as the basis for human peripartum cardiomyopathy. Clin Rev Allergy Immunol 2002;23:301-24. 17. Geva T, Mauer MB, Striker L, Kirshon B, Pivarnik JM. Effects of physiologic load of pregnancy on left ventricular contractility and remodelling. Am Heart J 1997;133:53-9. 18. Baruteau AE, Leurent G, Schleich JM, Gervais R, Daubert JC, Mabo P. Can peripartum cardiomyopathy be familial? Int J Cardiol 2009;137:183-5. 19. Fett JD, Sundstrom BJ, Etta King M, Ansari AA. Mother-daughter peripartum cardiomyopathy. Int J Cardiol 2002;86:331-2. 20. Mishra TK, Swain S, Routray SN. Peripartum cardiomyopathy. Int J Gynaecol Obstet 2006;95:104-9. 21. Fett JD, Christie LG, Carraway RD, Murphy JG. Five-year prospective study of the incidence and prognosis of peripartum cardiomyopathy at a single institution. Mayo Clin Proc 2005;80:1602-6. 22. Duran N, Gunes H, Duran I, Biteker M, Ozkan M. Predictors of prognosis in patients with peripartum cardiomyopathy. Int J Gynaecol Obstet 2008;101:137-40. 23. Gemici G, Tezcan H, Fak AS, Oktay A. Peripartum cardiomyopathy presenting with repetitive monomorphic ventricular tachycardia. Pacing Clin Electrophysiol 2004;27:557-8. 24. Ibebuogu UN, Thornton JW, Reed GL. An unusual case of peripartum cardiomyopathy manifesting with multiple thrombo-embolic phenomena. Thromb J 2007;5:18. 25. Desai D, Moodley J, Naidoo D. Peripartum cardiomyopathy: Experiences at King Edward VIII Hospital, Durban, South Africa and a review of the literature. Trop Doct 1995;25:118-23. 26. Mouquet F, Lions C, de Groote P, Bouabdallaoui N, Willoteaux S, Dagorn J, et al. Characterisation of Peripartum Cardiomyopathy by Cardiac Magnetic Resonance Imaging. Eur Radiol 2008;18:2765-9. 27. Travers B, O'Loughlin C, Murphy NF, Ryder M, Conlon C, Ledwidge M, et al. Fluid Restriction in the Management of Decompensated Heart Failure: No Impact on Time to Clinical Stability. J Card Fail 2007;13:128-32. 28. Mastrobattisha JM. Angiotensin converting enzyme inhibitors in pregnancy. Semin Perinatol 1997;21:124-34. 29. Rathore SS, Curtis JP, Wang Y, Birstow MR, Krumholz HM. Association of serum digoxin concentration and outcomes in patients with heart failure. JAMA 2003;289:871-88. 30. James AH, Jamison MG, Brancazio LR, Myers ER. Venous thromboembolism during pregnancy and the postpartum period: Incidence, risk factors, and mortality. Am J Obstet Gynecol 2006;194:1311-5; and Jacobsen AF, Skjeldestad FE, Sandset PM. Ante- and postnatal risk factors of venous thrombosis: A hospital-based case-control study. J Thromb Haemost 2008;6:905-12. 31. Davis SM, Branch DW. Thromboprophylaxis in Pregnancy: Who and How? Obstet Gynecol Clin North Am 2010;37:333-43. 32. Abboud J, Murad Y, Chen-Scarabelli C, Saravolatz L, Scarabelli TM. Peripartum cardiomyopathy: A comprehensive review. Int J Cardiol 2007;118:295-303. 33. Follath F, Cleland JG, Just H, Papp JG, Scholz H, Peuhkurinen K, et al. Efficacy and safety of intravenous levosimendan, a novel calcium sensitiser, in severe low output failure (the LIDO study): A randomised double-blind trial. Lancet 2002;360:196-202. 34. Slawsky MT, Colucci WS, Gottlieb SS. Acute hemodynamic and clinical effects of Levosimendan in patients with severe heart failure. Circulation 2000;102:2222-7. 35. Benlolo S, Lefoll C, Katchatouryan V, Payen D, Mebazaa A. Successful use of levosimendan in a patient with peripartum cardiomyopathy. Anesth Analg 2004;98:822-4. 36. Benezet-Mazuecos J, de la Hera J. Peripartum cardiomyopathy: A new successful setting for levosimendan. Int J Cardiol 2008;123:346-7. 37. Mebazaa A, Nieminen MS, Packer M, Cohen-Solal A, Kleber FX, Pocock SJ, et al. Levosimendanvsdobutamine for patients with acute decompensated heart failure: The SURVIVE Randomized Trial. JAMA 2007;297:1883-91. 38. Gevaert S, Van Belleghem Y, Bouchez S, Herck I, De Somer F, De Block Y, et al. Acute and critically ill peripartum cardiomyopathy and 'bridge to' therapeutic options: A single center experience with intra-aortic balloon pump, extra corporeal membrane oxygenation and continuous-flow left ventricular assist devices. Crit Care 2011;15:R93. 39. Malinow AM, Butterworth JF 4th, Johnson MD, Safon L, Rein M, Hartwell B, et al. Peripartum cardiomyopathy presenting at caesarean delivery. Anaesthesiology 1985;63:545-7. 40. Ray P, Murphy GJ, Shutt LE. Recognition and management of maternal cardiac disease in pregnancy. Br J Anaesth 2004;93:428-39. 41. Cruz MO, Briller J, Hibbard JU. Update on peripartum cardiomyopathy. Obstet Gynecol Clin North Am 2010;37:283-303. 42. Velickovic IA, Leicht CH. Continuous spinal anaesthesia for caesarean section in a parturient with severe recurrent peripartum cardiomyopathy. Int J Obstet Anesth 2004;13:40-3. 43. Pryn A, Bryden F, Reeve W, Young S, Patrick A, McGrady EM. Cardiomyopathy in pregnancy and caesarean section: Four case reports. Int J Obstet Anesth 2007;16:68-73. 44. Mellor DJ, Bodenham A. Infiltration anaesthesia in the management of caesarean section in a patient with peripartum cardiomyopathy. Anaesthesia 1996;51:409. 45. Bhakta P, Mishra P, Bakshi A, Langer V. Case report and mini literature review: Anaesthetic management for severe peripartum cardiomyopathy complicated with preeclampsia using sufetanil in combined spinal epidural anaesthesia. Yonsei Med J 2011;52:1-12. 46. Velickovic IA, Leicht CH. Peripartum cardiomyopathy and caesarean section: Report of two cases and literature review. Arch Gynecol Obstet 2004;270:307-1. 47. Shnaider R, Ezri T, Szmuk P, Larson S, Warters RD, Katz J. Combined spinal-epidural anaesthesia for caesarean section in a patient with peripartum dilated cardiomyopathy. Can J Anaesth 2001;48:681-3. 48. Pirlet M, Baird M, Pryn S, Jones-Ritson M, Kinsella SM. Low dose combined spinal-epidural anaesthesia for caesarean section in a patient with peripartum cardiomyopathy. Int J Obstet Anesth 2000;9:189-92. 49. Connelly NR, Chin MT, Parker PK, Moran T, Fitzpatrick T. Pregnancy and delivery in a patient withrecent peripartum cardiomyopathy. Int J Obstet Anesth 1998;7:38-41. 50. Shrestha BR, Thapa C. Peripartum cardiomyopathy undergoing caesarean section under epidural anaesthesia. Kathmandu Univ Med J (KUMJ) 2006;4:503-5. 51. George LM, Gatt SP, Lowe S. Peripartum cardiomyopathy: Four case histories and a commentary on anaesthetic management. Anaesth Intensive Care 1997;25:292-6. 52. Bilehjani E, Kianfar AA, Toofan M, Fakhari S. Anaesthesia with etomidate and remifentanil for caesarean section in a patient with severe peripartum cardiomyopathy--a case report. Middle East J Anesthesiol 2008;19:1141-9. 53. Shannon-Cain J, Hunt E, Cain BS. Multidisciplinary management of peripartum cardiomyopathy during repeat caesarean delivery: A case report. AANA J 2008;76:443-7. 54. Zangrillo A, Landoni G, Pappalardo F, Oppizzi M, Torri G. Different anaesthesiological management in two high risk pregnant women with heart failure undergoing emergency caesarean section. Minerva Anestesiol 2005;71:227-36. 55. Kaufman I, Bondy R, Benjamin A. Peripartum cardiomyopathy and thromboembolism; Anaesthetic management and clinical course of an obese, diabetic patient. Can J Anaesth 2003;50:161-5. 56. McCarroll CP, Paxton LD, Elliott P, Wilson DB. Use of remifentanil in a patient with peripartum cardiomyopathy requiring caesarean section. Br J Anaesth 2001;86:135-8.